1. In the HapYak portal, click "New Project"
2. There are three ways users can upload video content to a project. Upload a video file by dragging it from your desktop, or browsing your computer. Browse My Videos and select previously uploaded video files. 3. Select an Embed type. This is usually the place where the video is hosted. If your URL is directly to a video file (ending in ".mp4" for example) select an open source player (like VideoJS). 4. Enter a title and click Next. You should see the project load. if you get an error, click "New Project" again. 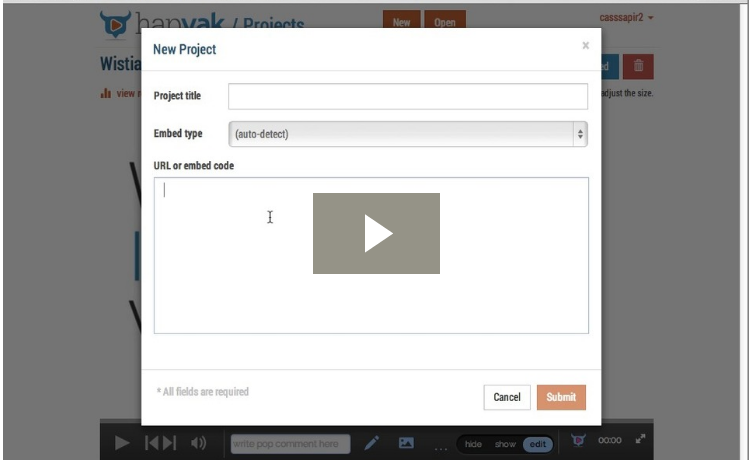 Ensure that the URL, embed code, or file type of the video is a supported format. If you have trouble, or your video player is not listed, send us an email and we'll add it to the list.